Growing up, saying no was a no-no! If a request was made, compliance was required. Now, I’m not talking about the obedience a child owes her parents. In most cases, obedience is for the child’s own good. Beyond that, the element of choice kicks in—or guilt. In my case, guilt was the motivating factor in my life. Later on my mother even observed, “Maybe I did too good a job with you.” Ya think, Mom? Thinking I had to say “yes” got me into at least one sticky family-related situation that affected my physical health and mental well-being. Maybe it took that experience to wake me up. I was at least sixty before I realized the world did not revolve around my blind compliance with every (family) desire. A trap—that’s what it was. Now, almost fifteen years later, I still find myself struggling to say NO, but this time it’s to myself. No, I don’t have to have the house in pristine condition before I can sit down to write. No, the laundry doesn’t have to come out of the dryer the second it buzzes if I’m hot on the trail of a new plot event in my WIP. No, I don’t have to limit myself to one afternoon a week at Sonic’s Happy Hour if I want to have an uninterrupted hour or two to read a stack of writing-related articles, make notes, or think about where my WIP is going next. Yes, I can turn down an invitation to lunch if I’d rather be writing. I can decline to keep the grandchildren if it doesn’t fit my schedule and isn’t an emergency. It’s okay. I’ve paid my dues in this life. It’s my turn now. 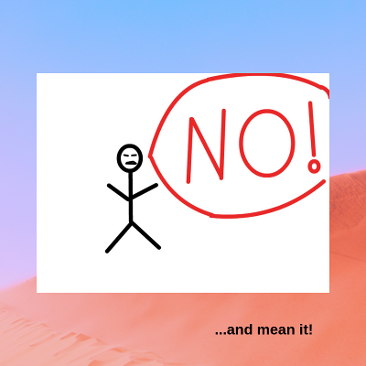 Saying NO can be a good thing. We all need to remember that—and ignore the guilt trips placed on us by other people and especially by ourselves! I recently read an excellent blog by Pauline Wiles: 50 Self-Care Ideas for Writers and recommend regular visits to her blog. This month I thought I’d give my take on a few of her suggestions—all of them workable for every writer with tweaking to fit individual circumstances. Some of them I’ve already been doing on my own, and reading her ideas validated mine in a nice way. The bottom line is, we all need to take care of ourselves first. That’s not selfish—it’s common sense like the flight attendants’ instructions to put your own oxygen mask on first before helping someone else like a child. It took me a lifetime to learn that killing myself for the benefit/convenience of other people not only didn’t do any of us any good—but it wasn’t what God wanted for the life He created in me. So here goes—and I’m paraphrasing, you understand. If a writer participates in NaNoWriMo, she needs a minimal daily word count to end up with 50K words at the end of thirty days. Of course, one can catch up if one falls behind. But sometimes I get bent out of shape with myself if I end up with what I consider too few words on a normal writing day—like zero words some days! I need to give myself a break! There are just some days I’m not productive, either because real life has interfered with my writing life—or I’ve just been a sloth! So one of the ways I take care of myself is to review the day and mentally list what I have accomplished. · write a little bit? Ten minutes? Twenty? · let my characters talk to each other in my head? · look over my writing plan and think where it needs to go? · write a blog—even get one blog ahead? · encourage another writer by commenting on her blog? · determine to write a review, remembering that reviews are a writer’s life blood? Today will be yesterday soon enough.